Bahahaaa, he looks like a little rag doll glued to the door! Don't get why it had to be a goddamn minotaur (you could very tenuously link it to the whole 'hotel as maze of fears' theme, I suppose), but **** it. Though it has some reasoning to it, The God Complex, and it was a complex to house a god. That and the whole Minotaur in a labyrinth and the people were offered up to the minotaur as they were in this? I think its eyes were too blue, looked silly imo. Imo, generally this season has been weak. It started of great but recent episodes show it becoming weaker and weaker. And the whole "Doctor dies" thing seems so awkward because they don't seem to have been building up to it. I mean fine, River comes, River goes like she has always done but I figured they would do something a bit more because this season has so much potential as they've built a family around her. I just hope the last two episodes change my mind. I'm hoping there'll be a, "oohhhh, it was all planned out and no-one saw it!" moment in the finale wrapping everything up nicely and not in 5 seconds...but who knows? I stand by my point that some episodes need to be an hour long. I also start many a sentence with "I." Yeah, I think the storyline's got worse recently - I thought the build up to AGMGTW was really good... however with the whole "Oh Amy's baby is now a fully grown woman lets forget about her..." thing its getting a bit annoying. Unless the forgetfulness is a plot device, the fact that Amy and Rory almost never mention their daughter is sooo bugging me. The Cybermen are peeping toms! Last 10 minutes reveal the Astronaut, is emotional and features a few Silents underwater (lake Silencio)? I thought maybe he was a cowboy on his way to a gunfight. We we always coming for you. It's a story - and this is where it begins. According to some accounts, it's the day the Doctor dies. 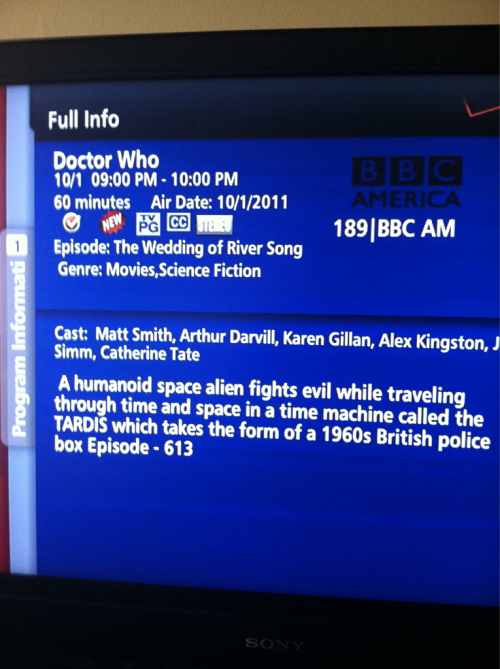 Doctor Song, how clever you are. Hey, I'm the Doctor, I was here to help. He seemed so happy, but so sad at the same time. Before I go, I'd like to know why I have to die? Just a random thought; do you think there's any relevance to River Song being a 'Doctor'? Yes but not in the way that a person might immediately think. If I had to theorise, I would say it's a name given during marriage. It would be far to obvious if she actually married the Doctor though. I would be SO dissapointed if she did. I think she did but also think that it was in no way a proper marriage at all or as simple as one would be. A bit similar to say how in The Doctor's Daughter, it wasn't really his daughter. And perhaps the same can be said for 'The Doctor's Wife'.